An AMAZING opportunity to cruise the east coast of the South American continent from north to south and visit Antarctica, Cape Horn & Patagonia. Situated across from Fort Lauderdale Beach, the hotels' location places you within walking distance of shopping, dining and the activities that make Fort Lauderdale famous. Suites feature private balconies, custom-designed beds and elegant marble bathrooms with whirlpool tubs. All offer magnificent views of the Atlantic Ocean. Spa Q offers both indoor and outdoor treatment areas, including the outdoor spa terrace. Hotel guests can enjoy a swim in the infinity pool or relax in one of the private cabanas. With a location near all of the most popular attractions and convenient access to public transportation,the 5-star Crowne Plaza Santiago makes it easy to experience everything the city has to offer. Elegant rooms feature Premium Bedding, and complimentary WIFI. Play a game of tennis on the outdoor courts, then relax in the whirlpool or swimming pool. Be sure to try authentic Chilean cuisine in the hotels signature restaurant'Caruso.' And at Trafalgar Bar, listen to live music with your favorite drink to end a perfect day in Santiago. 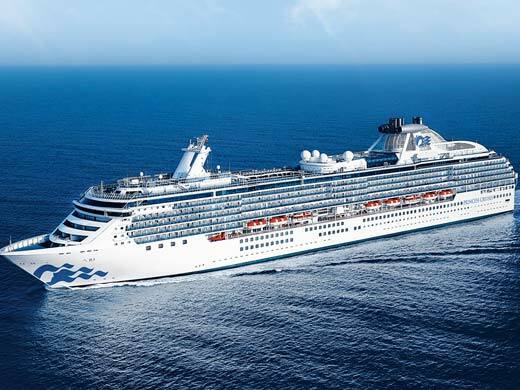 Coral Princess is one of just two cruise ships in the Princess fleet specially built to sail through the Panama Canal! Ninety percent of her staterooms offer ocean views, with 700 balconies available, perfect for witnessing the engineering marvel of the Canal. Spend the night watching a movie, concert or sporting event outdoors in a plush lounge chair at Movies Under the Stars® and escape completely® in The Sanctuary®, ship’s tranquil haven just for adults. Unique to Coral Princess and her sister ship, the Bayou Café and Steakhouse features live jazz music and flavorful New Orleans-inspired cuisine. Situated across from Fort Lauderdale Beach, the hotels location places you within walking distance of shopping, dining and the activities that make Fort Lauderdale famous. Suites feature private balconies, custom-designed beds and elegant marble bathrooms with whirlpool tubs. All offer magnificent views of the Atlantic Ocean. Spa Q offers both indoor and outdoor treatment areas, including the outdoor spa terrace. Swim in the infinity pool or relax in one of our private cabanas. With a location near all of the popular attractions & convenient access to public transportat, the 5-star Crowne Plaza Santiago makes it easy to experience all the city has to offer. Elegant rooms feature Premium Bedding & WIFI. Play tennis on the outdoor courts, then relax in the jacuzzi or swimming pool. Be sure to try authentic Chilean cuisine in the hotels signature restaurant'Caruso.' And at Trafalgar Bar, listen to live music with your favorite drink to end a perfect day in Santiago.